Without an audience's laughter to enhance the gags, this movie will likely fall pretty flat. 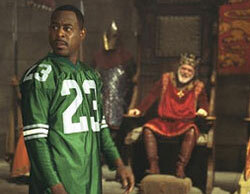 Call it "A South Central Homeboy in King Arthur's Court" -- but call it only occasionally amusing -- "Black Knight" stars Martin Lawrence going back in time to do his out-dated it's-a-black-thang schtick for 14th Century English royalty. Ten seconds into the movie, he's is already strutting like George Jefferson and doing a little booty dance just to show how dependent he is on such clichés. Then he goes to work at a dilapidated, castle-themed amusement park and falls into the fetid moat while reaching for a medallion he saw floating in the water. Somehow sucked into the past by the medallion, he's mistaken for a French ambassador when he says he's from Normandie (a street in Los Angeles). Thus his strange clothes, strange behavior and strange language are explained away as he teaches the Mediaevals to boogie, flash gang signs, speak street ("That's tight! Boo-yeah!") and fight like WWF wrestlers. Meanwhile, Lawrence is treated to the primitive joys of antiquated privies, horseback riding, crude table manners, broadswords, bloodletting and medicinal leaches (administered for no reason other than to service the gimmick). He's also recruited by a comely Nubian chambermaid (Marsha Thomason) to aid in the rebellion to restore a deposed queen. Many of the movie's seemingly ridiculous particulars (a chambermaid in regal gowns and tiaras?) are eventually explained away by the circumstances of Lawrence's time travel, revealed in the finale. But the same cannot be said for the fatigued, predictable and lazy nature of the script by Darryl Quarles ("Big Momma's House"). "Black Knight" could have sustained the level of its few laugh-out-loud moments, even with its conditionally contrived framework. However, it's pretty clear that Quarles, Junger and 20th Century Fox were content with the minimal effort put into this movie's hit-or-miss humor, counting on whatever audience Lawrence draws to have low standards.